If you want to take a weekend trip in California, this guide includes more than five dozen places you can go for a quick getaway. If you want to look at weekend trips that might be closer to your home, you can skip on over to browse weekend getaways in Northern California or find out what you can do for a weekend in Southern California. In a single day in Berkeley, you can buy a lava lamp, a snake's skeleton or a live snake; attend award-winning theater and symphony performances or enjoy a tribal music concert, and dine on anything from authentic Indian curries to the highest of cuisines. Berkeley is popular with people who love theater and the arts, shoppers, and foodies. This pair of small cities offers some of the Los Angeles area's best shopping, museums, architecture, and style. 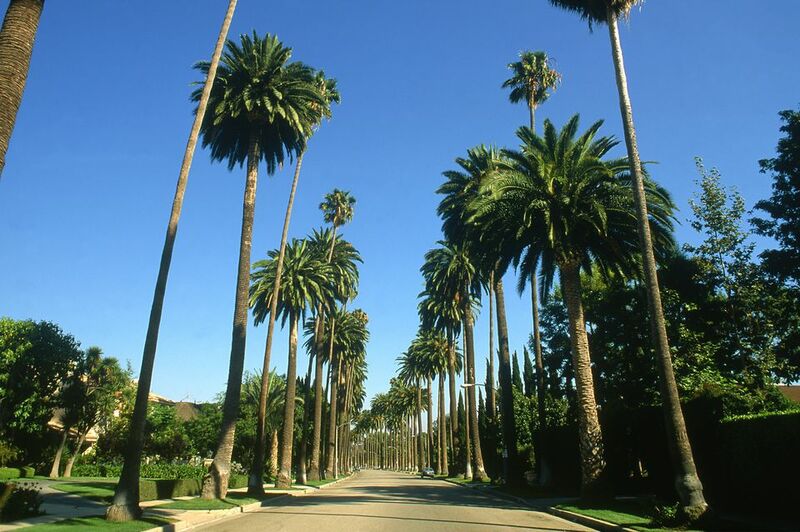 Beverly Hills and West Hollywood are popular with art lovers, shoppers, and anyone looking for great nightlife. California's Big Sur coast is the place most people think of when they say "California coast highway," a landscape of mountains diving into the sea, with a ribbon of road clinging to the cliffs. In Big Sur, the stars are brighter and there's plenty of undeveloped landscape and some fantastic beaches. 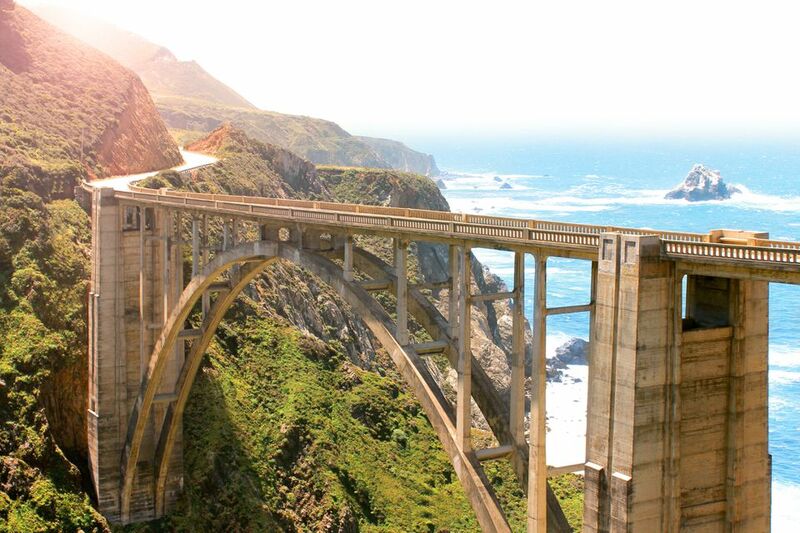 Big Sur is popular for romantic getaways, outdoor recreation, driving tours, and hiking. It has some extraordinary beaches, too. The northernmost town in Napa Valley is our favorite. Calistoga is the spa capital of Napa Valley, a charming small town with less pretense than some of its southern neighbors. You'll find some interesting things in the area beside its visitor-friendly wineries, making it an excellent place to enjoy Wine Country scenery but with different things to do while you look at it. Calistoga is popular for family outings, romantic getaways, and wine tasting. Cambria is a longtime favorite of visitors to California's central coast, and with good reason. It's far enough from the ocean to be sunny even when the beach is shrouded in summer fog; it has a lot of nice bed and breakfast inns and a cute little downtown to stroll and browse through. The lodgings along Moonstone Beach below town represent possibly the greatest concentration of nice places to stay in the state. Cambria is popular for shopping, relaxing, visiting the beach. It's also a good place to base a visit to Morro Bay or Hearst Castle. Carmel lies on the southern side of the Monterey Peninsula. It's the poshest of the area's three towns, filled with art galleries and high-end shops, shaded beneath Monterey pine and cypress trees. As you might expect, it's a good place for a laid-back weekend or a romantic getaway. Carmel is popular for romantic getaways, shopping, and nearby Point Lobos and Monastery Beach are very popular with scuba divers. Catalina Island is only 26 miles from bustling Los Angeles, but a world apart. Preserved in a conservancy, the island has only one town of any size, where residents often drive golf carts instead of automobiles. It's a place of extraordinary natural beauty, and one of the best places to de-stress in the state. Catalina is popular for romantic getaways, active weekends (especially for diving), family fun. It's a good place to get away from it all, rest and relax or enjoy a romantic interlude. Cayucos is on the central coast between Morro Bay and Hearst Castle. It's an unaffected little beach town with some beautiful places to stay and a pretty beach and pier. Cayucos is popular for antique shopping, fishing from the pier, relaxing on the beach. The saloon downtown has a card room where you can play poker. Cayucos is also a good base to explore Morro Bay and Cambria or visit Hearst Castle. Crescent City is on the northern California coast, just off US Hwy 101 and only 20 miles from the California state line. Crescent City is popular for the nearby redwood forests, whale watching and hunting agate rocks on the beach. In Death Valley, the earth sheds its mantle of green and gives way to fantastic geologic formations with fanciful names like Devil's Golf Course and Badwater. It's the lowest (and hottest) place in the United States, yet its historic National Park lodge, the Inn at Death Valley (formerly the Furnace Creek Inn) offers pamper-me luxury and finer service than you might expect in the middle of the desert. Death Valley is popular for outdoor recreation and driving tours. Many visitors also enjoy the nearby ghost towns, and it's a photographers' favorite. There's enough to do at Disneyland and California Adventure to keep people busy for days, but you can have a fabulous visit in just a couple of days if you use a few of our secrets. Disneyland is popular for family outings and a hit with kids of all ages. Eureka is a good center for exploring Humboldt County and the redwood forests of Northern California. Or maybe you'd rather go looking for Bigfoot. He/she/it has been sighted more here than in almost any part of California. Eureka is popular for hiking and outdoor recreation. Eureka and nearby Ferndale are popular with people who enjoy Victorian architecture. Gold Country is one of California's earliest settled areas, in the foothills of the Sierras, scenic and full of history. Gold Country is popular for historical sights, antique shopping, outdoor activities, and emerging wineries and it's a good place for families. Half Moon Bay is one of the closest places to run away to if you live in the San Francisco area, with lots of beautiful coastline and things to do. Half Moon Bay is popular for family getaways, beaches and water play and being active outdoors. Healdsburg is one of Sonoma's most popular towns, with lots of great restaurants and places to stay, a manageable wine region, and lots of free tasting rooms. Healdsburg is popular for food and wine getaways and active fun (especially bicycling). Built by newspaper tycoon William Randolph Hearst, the Hearst Castle is a fascinating look into the lifestyle of one of the early twentieth century America's richest men. It sits atop a hill overlooking the Pacific Ocean, with the bigger-than-life main house surrounded by guest quarters bigger than most visitors' homes. The castle is especially fun during an evening tour (summer only) or when it's decorated for the holidays. Hearst Castle is popular for family outings. Architecture-lovers may be interested in its designer Julia Morgan, and history nerds may enjoy the summer night tours, which showcase the Castle as it was in Hearst's day. Hearst Castle is within 200 miles of Bakersfield, Fresno, Los Angeles, San Francisco, and San Jose. It's been decades since Hollywood gained its reputation as the center of American filmmaking, and today's Hollywood sometimes fails to live up to visitors' ideas of it. Nevertheless, it's fun to visit for most people, who enjoy the blatantly touristy Walk of Fame and other attractions. It's also the home of the Hollywood Bowl, the Dolby Theatre where the Academy Awards are held and more. Hollywood is popular for family outings, nightlife and film lovers enjoy exploring its history. La Jolla means "the jewel" in Spanish, and it's an appropriate appellation for this lovely cliffside town just north of San Diego. Decidedly upscale, La Jolla offers great art galleries and shopping, beautiful coastal views and walks and some of the area's best beaches, including a California surfing icon. La Jolla is popular for family outings, romantic getaways, beaches, and kayaking. It's also a great foodie destination with some of San Diego's best-rated restaurants and a good place to go just to relax. The La Jolla Playhouse is well worth a trip if you like the theater. Laguna Beach is perhaps Orange County's least-overdeveloped beach town, and one of its prettiest. Created as an artist's getaway, Laguna Beach still feels artsy, with excellent art galleries and some fun summer arts festivals. Laguna Beach is popular for beach play, shopping, art galleries and festivals - and its seaside location sets the mood for romance. Lake County lies due north of Napa Valley, its southernmost town just up the hill from Calistoga. It's home to the largest, natural freshwater lake completely within California's borders, a beautiful body of water about 100 miles in circumference. We think it's one of California's nicest, less-discovered spots. Lake County is popular for fishing, boating, small wineries. Lake Shasta is one of California's prettiest lakes, surrounded by mountain scenery and with lots of inlets and coves to explore. The Lake Shasta houseboat experience is relaxing, with little to do all day but swim, cruise around exploring the lake's many coves, read, play games or take a nap. Lake Shasta Houseboats are popular for family getaways, active escapes or quiet relaxation. A clear lake in a natural bowl formed by the granite mountains around it, Lake Tahoe is a favorite of Northern Californians year-round. Although it's famous for winter skiing, it's even busier in summer when there are more things to do, and it's a perfect place to escape the summer heat. Lake Tahoe is popular for family outings, outdoor recreation, snow skiing, driving tours, hiking, fishing, boating and doing nothing. On the Nevada side of the lake, you'll find gambling casinos. In 1915, decades before Mt. St. Helens blew its top, Mount Lassen erupted, raining volcanic ash for 200 miles. The blast created an other-worldly landscape of boiling mud pots, steaming ground, roaring fumaroles and escaping sulfurous gasses, giving rise to place names like Bumpass Hell and Fart Gulch. This lightly-visited national park deserves a lot more attention than it gets, so go now before everyone else discovers it. Lassen National Park is popular for family outings, outdoor recreation, and driving tours. The thermal features draw photographers who try to capture their beauty. Often overlooked as a tourist destination, Long Beach offers a central location for exploring other parts of the Los Angeles area, close to major freeways and with some fun attractions of its own. Long Beach is popular for family getaways and with night owls who enjoy music and dancing. It's also one of the country's most dog-friendly cities. Los Angeles is within 200 miles of Bakersfield, Orange County, San Bernardino, and San Diego. The nearest airports are in Los Angeles (LAX) or Burbank (BUR). Lining the Santa Monica Bay north of the Los Angeles Airport, the towns of Venice Beach and Marina Del Rey offer a wide variety of things to do and a range of environments from funky Venice Beach to the high-end hotels lining the marina. The beach towns are popular for beach play, shopping, water sports, and amusements. The beach towns south of LAX provide some of the best places for a visitor to get a look at the real California beach life. You'll find places for long walks beside the ocean, volleyball games on the sand, surfers, and scenic piers where you can watch them. Did you know that Los Angeles has more than 80 stage theaters and 300 museums, more than any other U.S. city? A weekend getaway in LA can be culturally rewarding. Visit world-class museums, go to the theater, enjoy the finest in dining and take in some California sunshine along the way. As long as you enjoy the arts, you'll find something in Los Angeles that fits your particular taste, whether it's cutting-edge or ultra-traditional. Many big films premiere in LA, and almost everything that's released shows up on Los Angeles screens first. Films that never make it to smaller cities are sometimes showing at two or three places at the same time. Downtown is full of beautiful, old movie palaces and there are plenty of really nice theatres all over town, enough to keep you in the dark all day. Los Angeles is popular with film buffs of all kind, from classic silent films to cutting-edge indies. There's so much to do in downtown Los Angeles, from cultural activities to shopping and historical attractions, with new developments on the horizon. Downtown Los Angeles is popular for shopping in the Garment District, touring the historical areas, attending musical and theatrical events and exploring other cultures in Little Tokyo and Chinatown. It's probably LA's most famous beach city, with a beautiful stretch of sand, a great oceanfront path, and a seaside amusement pier. Santa Monica is popular for beach play and shopping. With the Santa Cruz Mountains as a backdrop and a downtown that revels in its lacy, Victorian-era architecture, Los Gatos is big enough to give you plenty to do, whether you go for the day or an entire weekend. Los Gatos is Popular for shopping, fine dining, and outdoor activities. It has one of the area's prettiest, best-preserved downtowns, making it popular with locals and visitors alike and it's a good base for wine tasting in the Santa Cruz Mountains. The Malibu coast on the north edge of Los Angeles has a reputation bigger than its geographic area. Besides the small town of Malibu, you'll find plenty of places for oceanfront play - and some excellent wineries in the mountains just inland. Malibu is popular for beaches, scenic drives, and surfing. California's Mendocino coast boasts some of its wildest and most spectacular coastal scenery. The area seems almost littered with cute little bed and breakfast inns, and few can resist the sight of the town of Mendocino and its New England-style architecture. The forests are filled with blooming rhododendrons in spring, and the Mendocino Botanical Garden always has something in bloom. Mendocino is popular for romantic getaways and driving tours. It's also a good place to settle into comfortable lodgings and do nothing at all. The area east of the Sierras is little visited, but one of California's most fascinating places. Its high desert landscape features dormant volcanoes, unique rock formations, a lake so salty that little can live in it, steaming geothermal features, and some of the country's best snow skiing. Scenic Highway 395 is popular for family outings, outdoor recreation, driving tours, hiking fishing and photography. It's also affordable, with moderate hotel prices and many free attractions. Of the three towns on the Monterey Peninsula (the others are Pacific Grove and Carmel), Monterey is the least pretentious, staying close to its roots as a cannery town. Today, carefully tended sea creatures find a home at the Monterey Bay Aquarium (a former sardine cannery) and Fisherman's Wharf is home to more whale-watching boats than fishing trawlers, but Monterey is still a favorite place for many visitors. Maybe it's those gorgeous ocean views. Monterey is popular for family outings, kayaking, fishing, whale watching and scuba diving. Morro Bay lies unassumingly just off California Highway One south of Hearst Castle, most notable to passers-by for the monolithic Morro Rock in the harbor. It's a cute place, and one of the most affordable along the California coast, with lots of interesting natural sights. Morro Bay is popular for family outings and outdoor recreation. A large colony of elephant seals takes up residence nearby in winter, a sight well worth a trip to just to see. And it's one of the most affordable spots on the California coast. Long bypassed as visitors raced north into the Napa Valley, the town of Napa has been undergoing a revival in the twenty-first century, and it's becoming a more interesting place to visit every year. A weekend will give you just enough time to check out what's new. Napa is popular for wine and cuisine. The long, narrow valley anchored by the town of Napa on the south and Calistoga on the north makes a perfect place for a weekend escape. Besides the obvious wine and food-related activities, you can have fun getting muddy (with or without the kids). Napa Valley is popular for wine and cuisine - and better for families than you might expect. Many Southern California residents don't even know about the charming part of Newport Beach, Balboa Peninsula and the islands that cuddle inside the marina, but you do. This part of Orange County seems like it came from a different era and it's sure to charm you. Newport Beach is popular for family outings, boating, harbor tours, fishing, and doing nothing. Ojai (OH-hi) is situated in a small valley about 15 miles from Ventura and the Pacific coast, surrounded by citrus groves and the protective Santa Ynez Mountains. The town settles down into its valley like eggs into a bird's nest, giving credence to some people's contention that its name means "nest" in the Chumash Indian language. Ojai is popular for a relaxing getaway or a romantic interlude, with just enough to do at a leisurely pace. The westernmost of the Monterey Peninsula towns boasts a seaside drive that's prettier than the 17-Mile Drive, a historic lighthouse, and a lovely downtown. It's also home to some of the area's nicest bed and breakfast inns and Asilomar Beach, one of the prettiest stretches of sand in the county. Pacific Grove is popular for family outings, romantic getaways, driving tours, beach play and golf. Perhaps best known for its annual New Year's Day parade and as the home of Cal Tech University, Pasadena carries an air of early twentieth-century elegance and is home to some of the best Arts and Crafts-style architecture you'll find anywhere. Pasadena is good for architecture, art, and public gardens. In the 1950s, Palm Springs was Hollywood's playground, site of many big-name movie stars' second homes. After a period of decline, Palm Springs is glamorous again, with many of its "mid-century modern" (designer-speak for the 1950s) properties being restored to their former glory. Tour companies can take you to visit Indian Canyons, through the desert in a Hummer, for a drive along the San Andreas Fault or to see the electricity-generating windmills up close. Palm Springs is popular for driving tours, shopping, casinos, golf and simply laying around a swimming pool and a center for mid-twentieth century architecture getting some sun. Paso Robles is the center of an emerging wine area, gradually transitioning from an agricultural community into a center of wine and cuisine. Paso Robles is popular for wine tasting and outdoor recreation. Pebble Beach is a collection of luxury hotels and challenging golf links, strung along the legendary 17-Mile Drive south of Carmel. Pebble Beach is popular for golfing, outdoor recreation, excellent lodging, and dining - and its luscious scenery and top-notch make it ideal for romantic escapes. Pismo Beach calls itself Classic California, and with good reason. A five-minute drive from busy US 101 takes you to the quintessential California beach town, with a bustling fishing pier, surfers in the water, salt water taffy and clam chowder for sale nearby. Just around the edge of the bay, you'll find Oceano Dunes, a large sand dune park where you can play all day. Pismo Beach is popular for family outings, outdoor recreation, driving off-road vehicles on the sand dunes, beach camping, fishing, and beach play. Northwest Marin County offers rural countryside views across the scenic Tomales Bay. It's also home to Point Reyes National Seashore. Tomales Bay and Point Reyes are popular with nature lovers, outdoorsmen and anyone who wants to get away from it all. You'll also find some nice beaches at Point Reyes. The Russian River runs southward from northern California, turning west through Sonoma County toward the sea. The small towns on and near the Russian River are some of the cutest in this part of California - and each has a distinct personality. The Russian River is popular for wine-tasting, water play on the river, hiking in the redwoods. Active families who enjoy water sports can have a ton of fun in their floating house on the river. The Sacramento Delta is popular for water play of all kinds, and a houseboat makes a good base to do it all from. Perhaps better known for agriculture than tourism, Salinas is the birthplace of author John Steinbeck and home of the museum built in his honor. In Salinas, you can visit a working farm or spend the night at a safari-style bed and breakfast with some very unusual breakfast servers. Salinas is popular for family outings and driving tours. Steinbeck's fans flock to the Steinbeck Center, and the city hosts a big air show and rodeo every year. San Diego is California's sunniest coastal city and offers lots of water-oriented activities. It's also home to animal-based attractions and a fun theme park based on LEGO toys. San Diego's tourist scene changes slowly, but if you've never been or haven't been there in a long time, give it a try. San Diego is popular for family outings, outdoor recreation, and beach play. This tasty mix of popular tourist attractions and the real city behind the tourist facade will have you planning a return trip lickety-split. San Francisco is popular for family outings, romantic getaways, great food - and the arts. San Francisco is within 200 miles of Fresno, Reno/Tahoe, Sacramento and San Jose. San Francisco is an oft-repeated backdrop for films of all kinds. Francis Ford Coppola's American Zoetrope Studios are here (in the oddly-shaped building at Kearny and Columbus), as is Lucasfilm (in the Presidio). Unfortunately, neither give tours, but for any film lover with a good visual memory, walking around town is like one big movie tour, anyway. San Francisco is popular for film festivals (they have dozens) and film sites and it has one of the state's finest movie houses, too. Japantown is a unique cultural opportunity, one of only a few Japantowns in the continental United States, along with Japantown in Los Angeles and San Jose. And you can be there all weekend without taking your car out of the garage. Japantown San Francisco is popular for shopping, exploring Japanese culture, and relaxing at a Japanese-style bathhouse. Santa Barbara is sometimes called the American Riviera. It's a lovely town, with white-washed, red-tile-roofed buildings draped over the hillsides, a protected bay and a south-facing beach that all conspire to give it some of the most pleasant weather on the California coast. Santa Barbara is popular for romantic getaways, beaches, outdoor recreation, biking, and shopping. Santa Cruz sits at the north end of the Monterey Bay and is home to the largest surviving oceanfront amusement park in California. It's a cozy town with a lively music scene, extraordinary natural beauty and a laid-back ambiance that makes it easy to relax. On summer weekends, Highway 17 going toward Santa Cruz is choked with cars heading for the beach, but the rest of the year, it's less crowded and more fun. Santa Cruz is popular for family outings, outdoor recreation, surfing, boating, and shopping. In the winter, monarch butterflies congregate on the trees near Natural Bridge. The Santa Ynez Valley may have gained attention as the setting for the film​ Sideways, but it was a great place to visit long before that. Separated from the Pacific Ocean by the Santa Ynez Mountains, it's a broad, scenic valley with a distinctively rural feel - a perfect place for a Sunday drive or a relaxing weekend. The Santa Ynez Valley is popular for wine tasting, shopping, driving tours and outdoor activities. Its cute little towns are a great romantic getaway idea, too. Sequoia National Park and adjacent Kings Canyon are a great alternative to Yosemite. It's less visited, has bigger trees, and features a glacier-carved granite valley that's beautiful. Sequoia National Park is popular for family outings, outdoor recreation, driving tours, and hiking. Less crowded than Yosemite, it's also a good place to get away from it all. At the Sequoia High Sierra Camp, you can enjoy all the pleasure of camping in the wilderness with none of the inconvenience. Sequoia High Sierra Camp is popular for campers, hikers, nature lovers, and photographers. It's a good place to get away from it all and relax. Northern California's Shasta and Siskiyou Counties could well be called Shasta Country. Here you'll find Mount Shasta, Lake Shasta, and some small, historic towns where you can putter around. This area also affords fishing, water sports, and boating, as well as mountaineering and a nice ski and snowboard area open in winter. Shasta Country is popular for family outings, outdoor recreation, driving tours, hiking, fishing, and boating. Lost in what almost feels like a time warp in western Sonoma County, Occidental is one of the cutest little towns you can imagine, with just enough to do in the area to keep you entertained but not enough to wear you out. It's also close to the very unusual Osmosis Spa, which you may enjoy. This area is popular for romantic getaways, driving tours, and doing nothing. Sonoma is less crowded than Napa Valley, with the wineries more spread out, friendlier and on the whole, and less pretentious. The Sonoma countryside lacks the well-defined "valley" feel you'll get in the county next door, but it doesn't want for beautiful scenery. Sonoma Valley is popular for wine tasting, fresh-grown produce, and beautiful scenery. You'll find lots of historic landmarks in Sonoma, too. The Valley of the Oaks is an isolated valley with a landscape little changed since Spanish explorers made their way through, and home to an old Spanish mission that's still a working church. You'll also find a lake here where eagles nest, and a scenic drive out to the Big Sur coast. Valley of the Oaks is popular for family outings, driving tours, wild boar hunting, and recreation on Lake San Antonio. Wildflowers often carpet the valley in spring. Yosemite is one of the country's oldest national parks and one of the most popular. It's unfortunate these days that the park's beauty threatens to be its downfall, with the valley overcrowded in summer and the campgrounds so packed that you may feel like you're in the middle of a freeway at rush hour. Go to the valley off-season or head for locales outside the valley any time, and you'll have a lot more room. Yosemite is popular for family outings, outdoor recreation, driving tours, hiking, fishing, doing nothing, wine, and cuisine. Off-season, it's a good place to get away from it all.